RHRLI is committed to educating our patients and giving them the best treatment in a very comfortable fashion. It’s why we offer the most minimally invasive hair loss procedure that’s available. We do also treat some patients with FDA approved medications. We know there’s a lot of confusion about hair loss medication treatments out there. So we want to tell you how medication affects thinning hair. RHRLI is Long Island’s leading hair loss treatment center, and we’re the only practice on Long Island that has the ARTAS® Robotic Hair Transplant System. This revolutionary Robotic Follicular Unit Extraction (FUE) procedure uses robotic technology to find healthy donor hairs and transplant them to where they’re needed. Most of our ARTAS® patients report little to no pain, and the procedure is the most precise hair transplant you can find. Before we do any procedure, our board-certified surgeon, Dr. Baiju Gohil will consult with you and design a treatment plan for you. As we mentioned, some patients are treated with medication, so let’s take a look at them. Minoxidil, often referred to under the brand name Rogaine, this was the first drug ever approved by the FDA for male pattern hair loss. According to AHLA, minoxidil has been clinically proven to slow the progression of hair loss and regrow some hair, but many experts say it’s only marginally effective. AHLA does recommend this medication for those who don’t respond to other treatments. 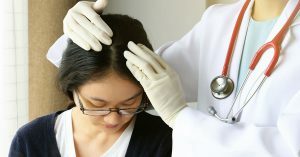 Consumer Reports says minoxidil is “probably” worth trying, citing a 2016 study which showed that twice as many women who used the medication experienced at least moderate hair regrowth compared to a group that was given a placebo. Finasteride, marketed under the name Propecia, was the second medication to receive FDA approval. It inhibits the enzyme that converts testosterone into dihydrotestosterone (DHT). DHT shrinks hair follicles, resulting in male or female pattern hair loss. In clinical trials 86 percent of men who were taking the drug saw a 60 percent reduction of DHT, while 65 percent of those involved in a study saw a substantial increase in hair regrowth. But there are side effects associated with finasteride that can cause issues with sexual performance. These issues can continue even after you stop taking the medication. It should be noted that these medications are only effective as long as you take them and they will stop working once you cease using the medication. If you’re looking for a permanent solution, RHRLI and ARTAS® have it. Our FUE procedure doesn’t require the use of a scalpel or stitches, and you’ll be back to your regular life in days. To learn more, contact us today.